Bit more on trees, with a couple of pictures from “Broad Gauge Railway at Watchet”. 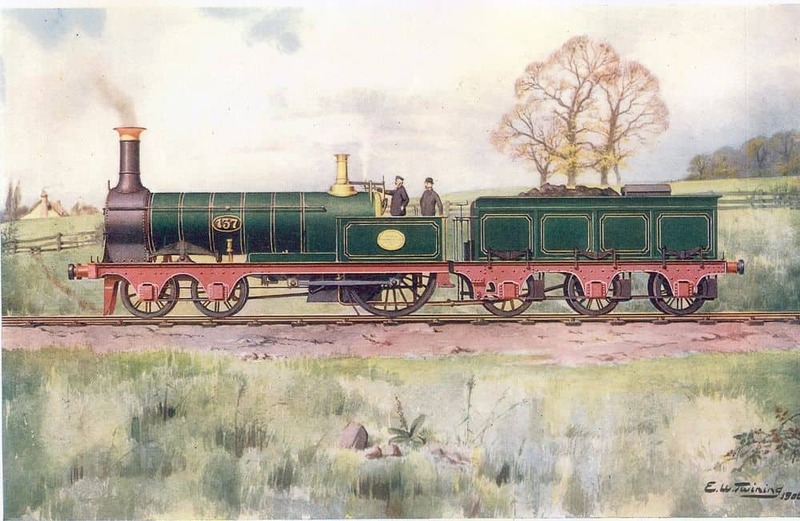 First off is at Watchet in 1864 with a composite picture. You’ll see some mature trees on the hill behind the station, and scattered beyond the town, and it looks quite well wooded in the valley up past where the paper mill was. Then there’s quite a noticeable clump/ row growing up the ridge behind the town, quite exposed. Then a view of Minehead, soon after the extension there in 1875. The station is up at the left top, with some new houses and hotels going up. The old settlement is in the foreground by the Quay. The open space between the two and off to the right is ready to be developed. The thing is all the fields stretching off into the distance have hedge boundaries, with developed trees scattered here and there along the hedges. This is a view from high up on North Hill, if you drop down to the railway level, all you see stretching away is trees, well spaced in fields, but sufficient to overlap as they recede. Very typical landscape, particularly before Dutch Elm disease came along. I think your KESR line is good for close up detail of trees. Thank you very much for those photos Northroader they will be very useful. A copy of the “Broad Gauge Railway at Watchet” is definitely on my shopping list and I'll be ordering a copy next week. 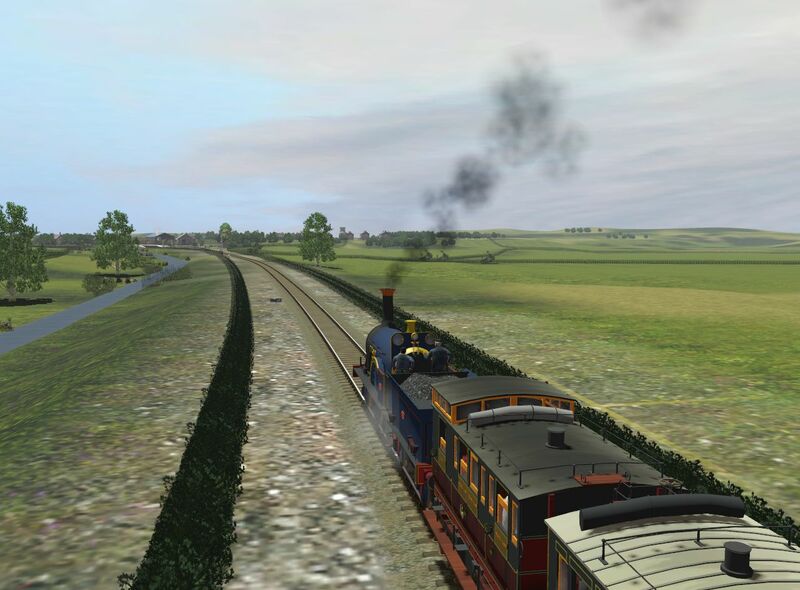 This old Minehead branch layout from TS2004 days is simplified in many of its details, but the actual shaping of the landscape has been well done so it has good bones to build on. The K&SER layout still has work needing to be done with tree planting and replacement, but it's very much getting there and definitely does have the right look to it regarding trees. 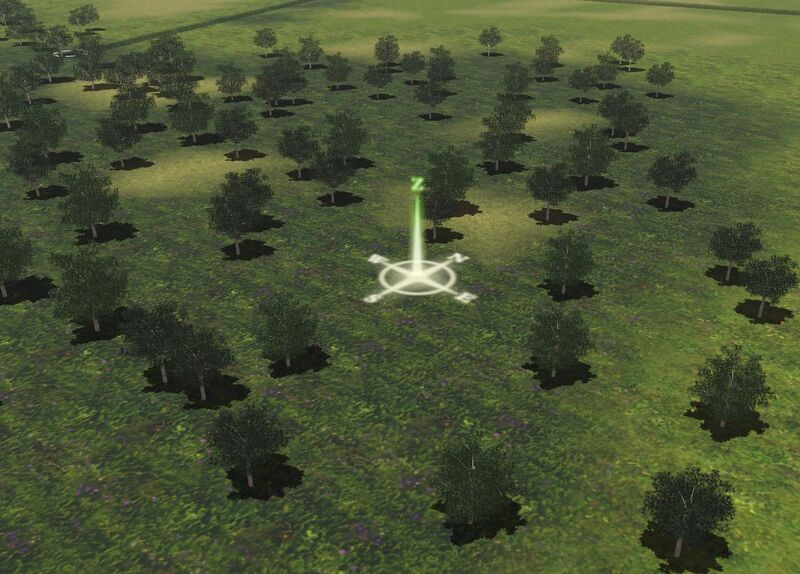 Finding good tree models is always a problem and it was a bit annoying to discover that some of the really good tree models from TS2012 won't work in TS2019. That was slightly stupid. I found a second hand copy of the “Broad Gauge Railway at Watchet﻿” on-line and it was cheaper than new and in reasonable condition so I purchased it only to discover the postage cost had killed my bargain and it would have been cheaper to buy it new from Lightmoor Press. BUT never mind at least I have finally ordered the book after just talking about ordering it for more than a year. Run and hide, - the inspectors are about! Stop rubbing your eyes, - there really was a locomotive like this little single driver well tank. If fact there were three of them, but I only have one since it's not exactly the kind of engine I would need two more of. Later on they were properly rebuilt to be inspection engines with a coach compartment mounted on their frames. This one is a little roller skate running under the advanced steam controls and I think it might just have an engine spec that's just a wee bit too energetic for it. Lots of fun to drive though and it does make a nice inspection engine for the line. 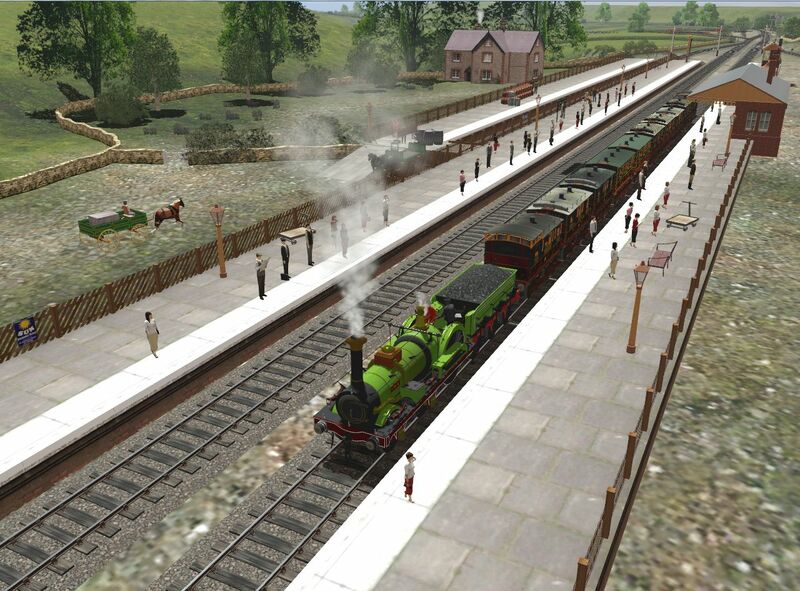 The latest snap of Minehead station. This is my SG converted version. Some tree planting has been done, but I'm still working my way through around 250 trees I downloaded this morning to see which ones would be the most suitable for the layout. 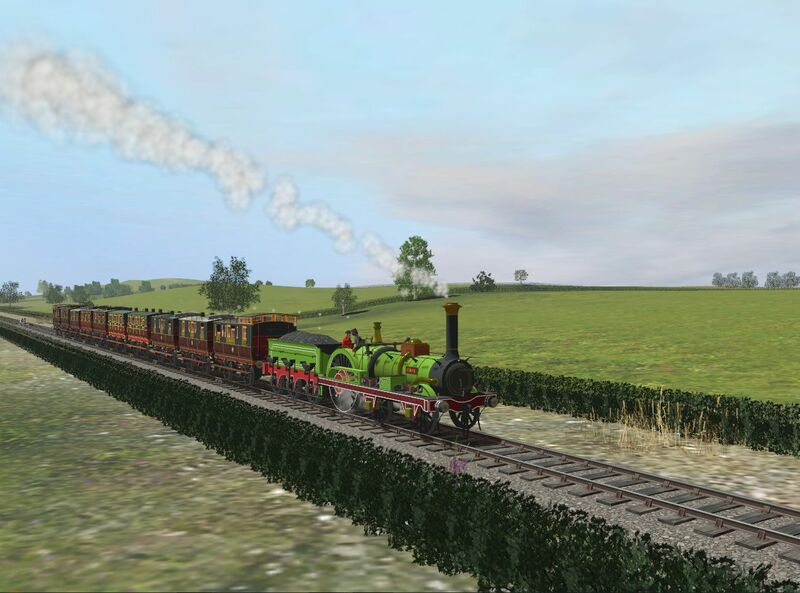 There's this Russian chap who makes really excellent tree models for Trainz and the numbers of trees he's made borders almost on the obsessive. As an example he's made over 50 birch trees and every single one of them is different with no two being the same. The only problem is all the file names are in Russian which can make identification a little difficult. Which leads me to show you Sampler Forest. This is by no means all of the trees, by the way, just the ones that I think might be useful. 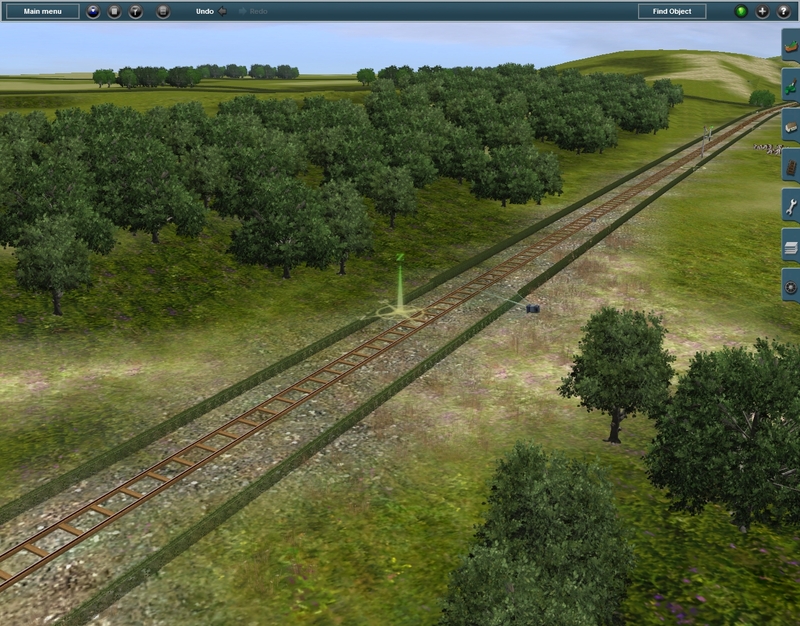 I planted it all out on an empty corner of the layout and from a distance it just looks like a forested patch of ground, but when I come to do some serious tree planting being able to see what all the trees look like so I can select the ones I want is going to save me a lot of time. 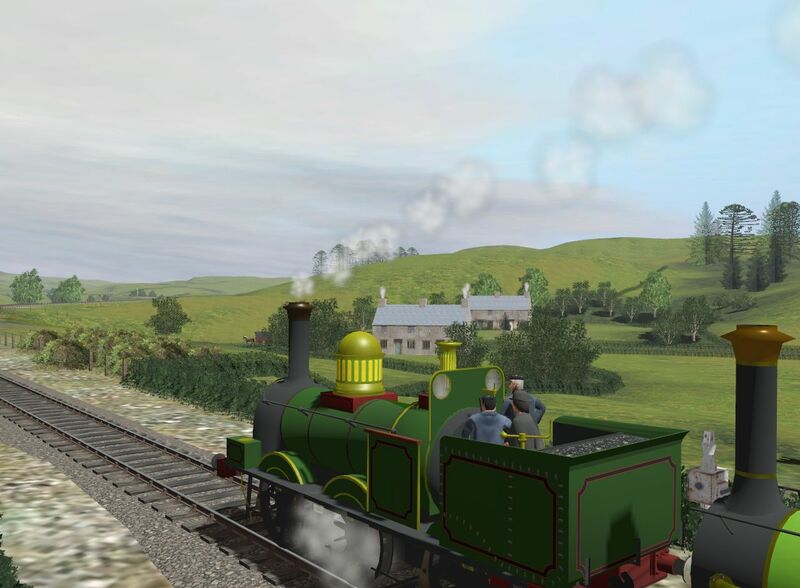 The little inspection engine has had a visit to the works and the paintshop and has also been renamed 'Eastlingwold' since it's the kind of engine the Eastlingwold & Great Mulling Railway would be proud to own. With an engine spec much more suited to its size and weight it's now a very nicely behaved wee engine that doesn't want to rush off at insane speeds if I move the cutoff past 3%. Evidence of the new reforestation program. 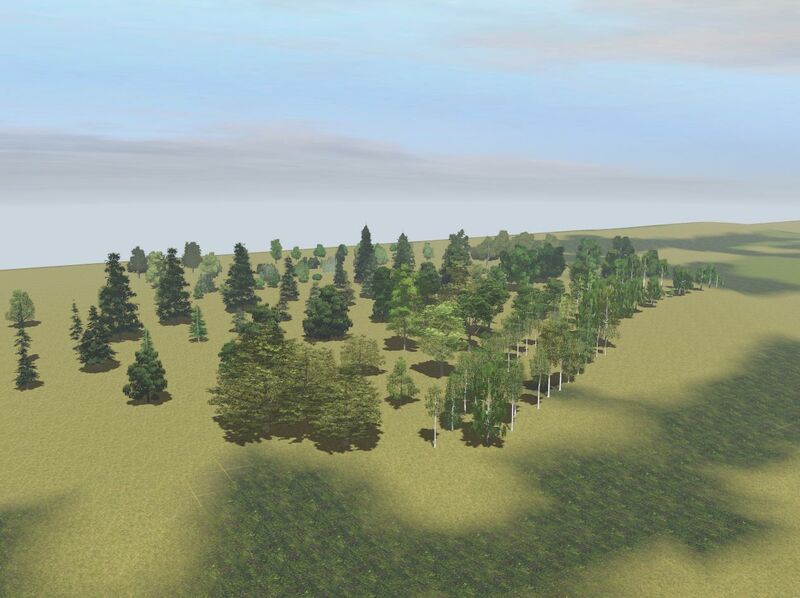 I was trying to figure out what had happened to the trees on the layout in some of the well forested parts when I transferred it across to TS2019. Then I realise what had happened. All the large spreading TS2012 broadleaf trees had been replaced by small boofy TS2019 lollipop trees of no great size which had completely changed the look of the landscape. Now armed with some fairly serious large tree models I'm working on restoring the forested areas and generally improving things. Thanks very much James. It's a seriously fun little engine. The invasion of the small boofy lollipop trees. And these are the small boofy lollipop trees that the TS2019 simulator replaced them with. For some strange reason they can't be removed and they seem to have no listing in the scenery assets menu, - so what I'm doing is planting bigger and better trees in amongst them. They can't really be seen then since they are faint wispy things and when they can be seen they blend in and look like young trees of no great size. 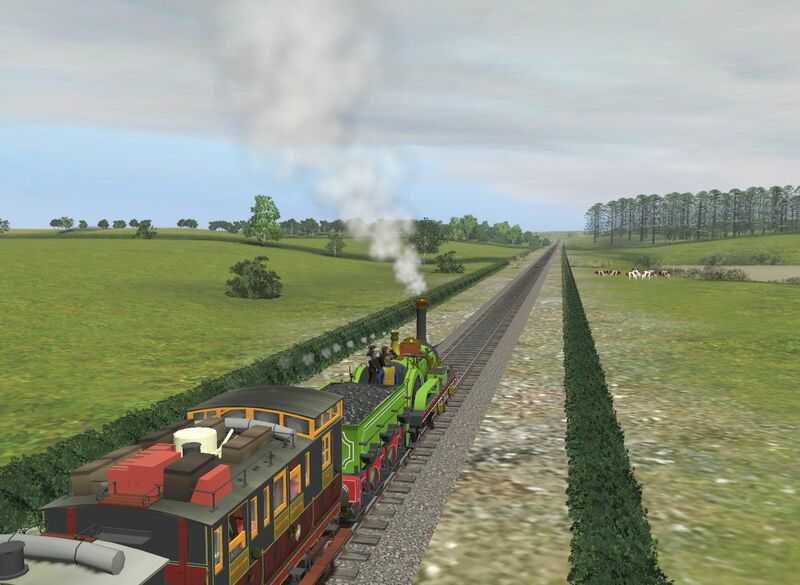 It all takes a while to do though since the layout is 25 miles long, but we're making progress. Snaps taken while driving No.3 to Bishops Lydeard. I'm getting a lot better at using the advanced steam controls now. Train weight 133 tons. The unrelenting gradient. The last half mile or so before Crowcombe Heathfield is pretty darn steep and No.3 was working hard. Keeping a careful eye on coal and water levels over the entire climb from Blue Anchor to Crowcombe Heathfield is absolutely essential. A nice challenge and a lot of fun. And just to make it a bit harder it's all steeply downhill to Bishops Lydeard. No continuous brakes, just the brakes on the engine and tender and great care taken with the regulator and cutoff settings. 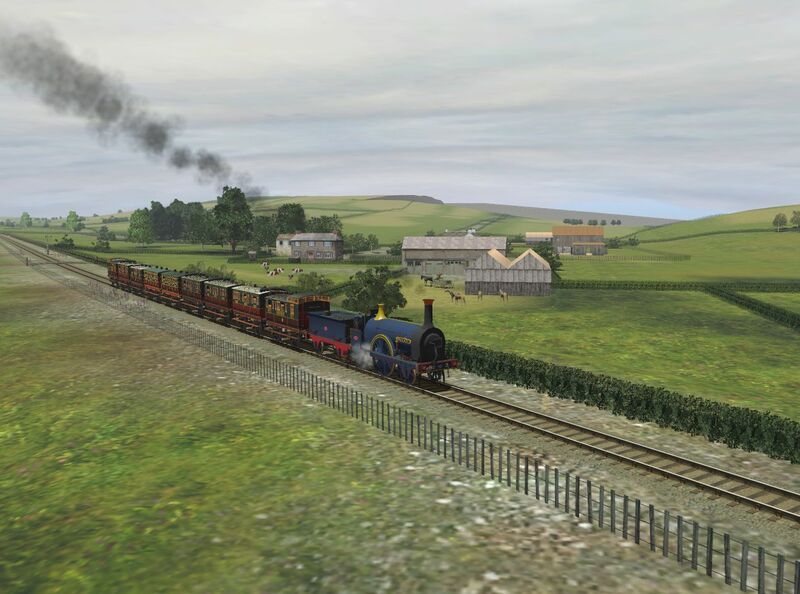 'Yes', you might say, - 'that's a nice view from the footplate', but what a fiddle it was to set it up. 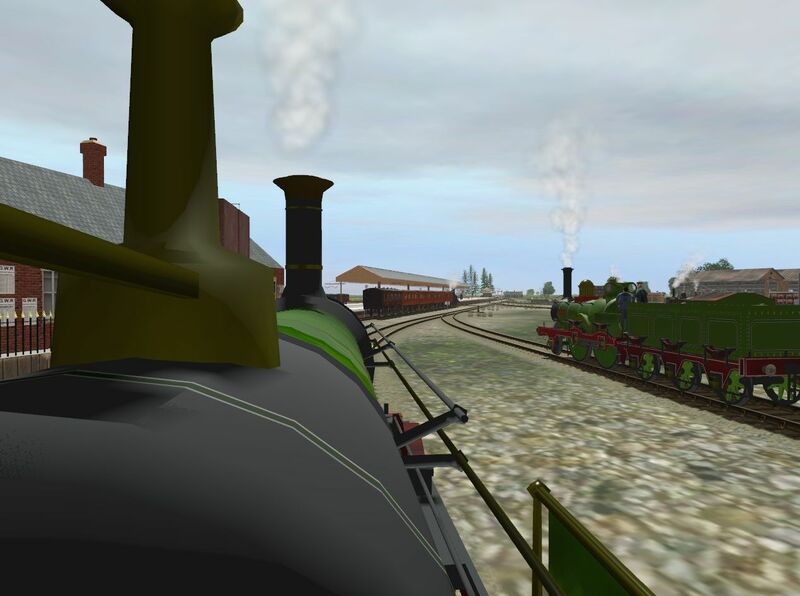 The old footplate view arrangement doesn't work anymore in TS2019 so I had to take a TS2019 compatible 'invisible cab' and then position it by trial and error on the loco's body mesh. 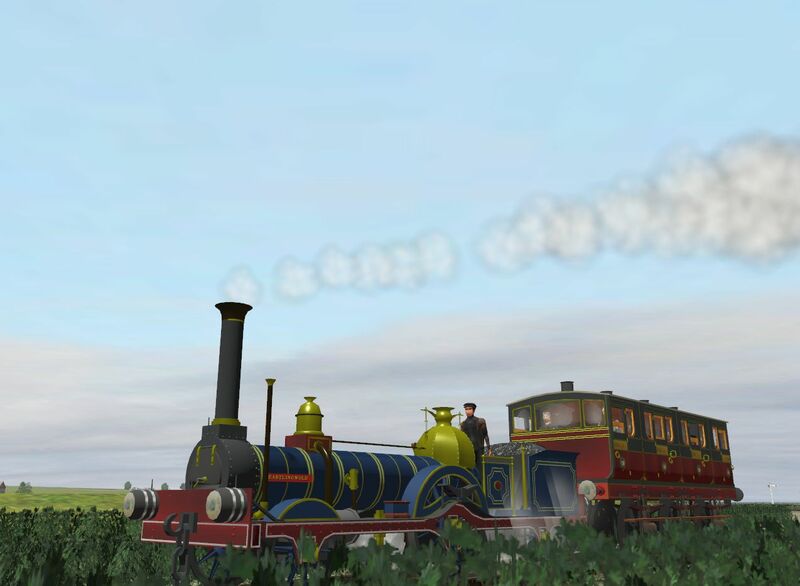 I did get the hang of doing it eventually so hopefully I'll be able sort out all my other mid-19th century engines without too much trouble. And this is the engine I was using as my test subject. A SER Crampton. A seriously magnificent engine and one of my favourite engines in my collection. 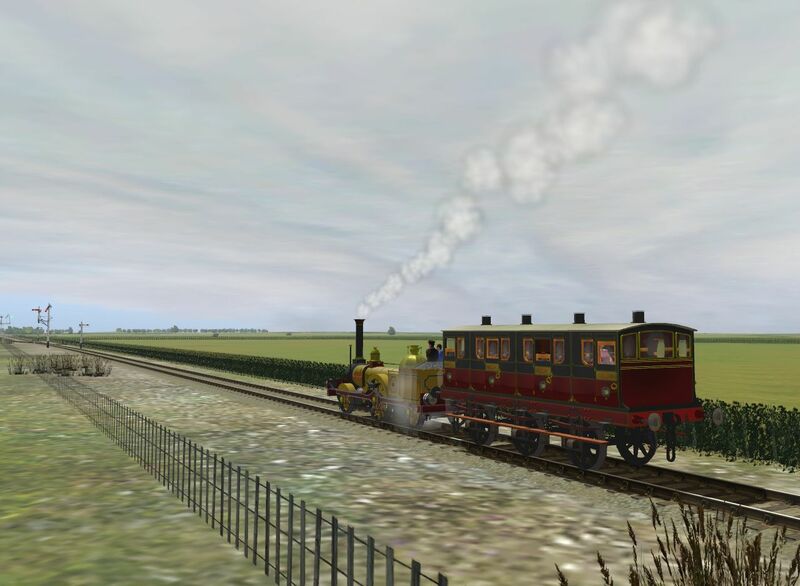 It's had some work done on its engine spec so it works properly now using the steam engine control set and initial trials are looking very good indeed. Unfortunately I can't do anything about the AI robot driver appearing on the footplate. If I place a driver figure on the same spot the AI driver will still turn up and look like it's trying to burst out of the driver figure's skin. Not nice at all. I can move the attachment point back further though to keep them out of the way and stop them breathing down my neck while I'm driving. Thanks very much for that Northroader. Very nice to wake up to. I like Cramptons. 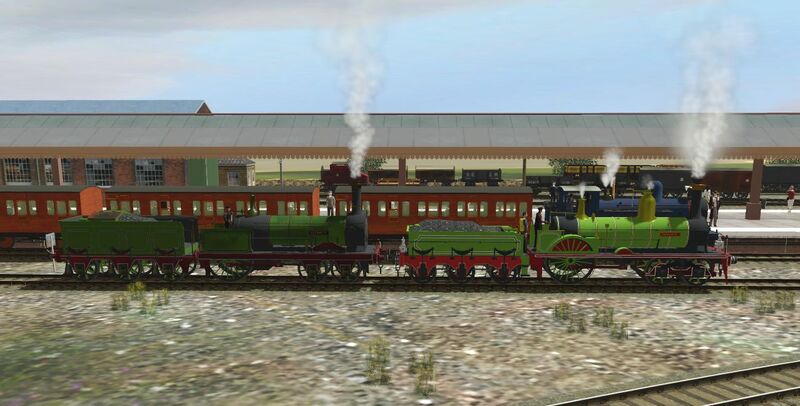 Paul of Paulz Trainz has digital models filed away that aren't on his website and that's where the SER mucky dark green one came from. On further enquiry I discovered that Paul had LCDR Cramptons as well so I got three of them. All bright and shiny light green ones with different names. After changing the footplate crew figures and updating the footplate view to work under TS2019 it was time for a test run. Paul's 'one size duz all' engine spec is something I have a love/hate relationship with. For a start it could steam for Britain and on larger engines it does work more or less Ok, but you'll never need to go further than 20% cutoff on even the steepest hills. With smaller engines this engine spec turns them into steam powered roller skates with dreams of breaking Mallard's record. In fact I think I've discovered why some of Paul's small engines are carrying more than their own weight in water; - it's the only way to slow them down and make them behave! The other thing about Paul's engine spec is that it gives any engine that's using it terrible brakes. Fitting an e.spec brake to the tender does help though. I flubbed saving the picture, but I had the LCDR Cramption working a 177 ton train up an 85% gradient at 10% cutoff and it was just, 'Meh, is this all you've got'. 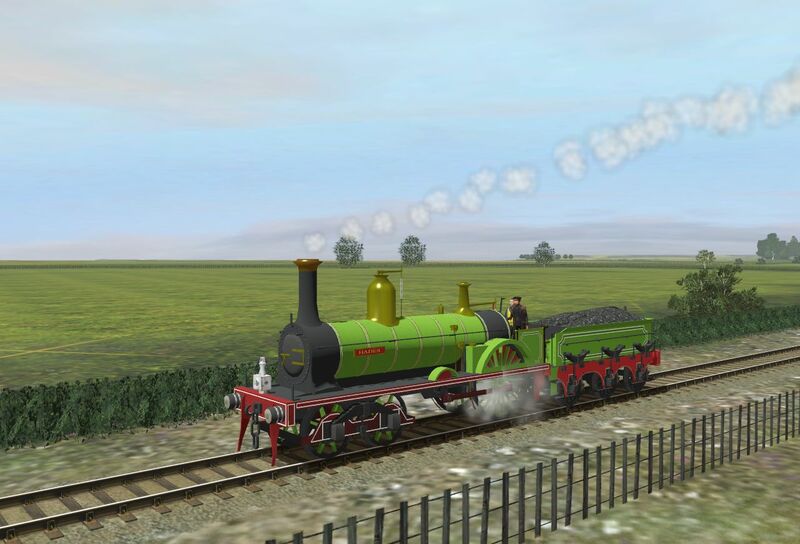 The mucky dark green SER Crampton runs a very well written Fowler 2P engine spec file and its performance is a little more believable. It's a good steamer too, - again in a believable way, - and the brakes actually work. Soooooo I guess my new engines will be getting 2P engine specs and they'll have to like it. 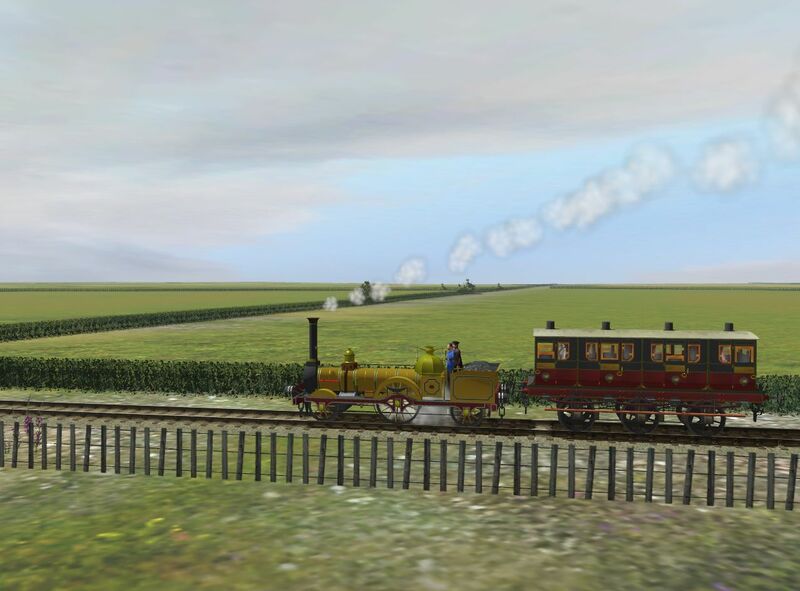 Yesterday evening I was feeling a bit better so I was running some of my Crampton locomotives. I will hasten to point out though that a Crampton would be about the last locomotive type you'd expect to find on the Minehead branch. Cramptons were at their best on lines that were largely flat and with long distance between station stops such as those in northern France and Germany. Bishops Lydeard. The climb up to Crowcombe Heathfield from here is seriously steep. Not a happy engine. I didn't carry on with this for too long since it was hard to make any forward progress without slipping. LocationPressing the TAC Plunger for the 11:25 arrival into Medstead & Four Marks! I know that this is essentially hijacking Annie's thread, but here are some recent TS shots from me, showing some of my new toys (well... new since I last posted!). 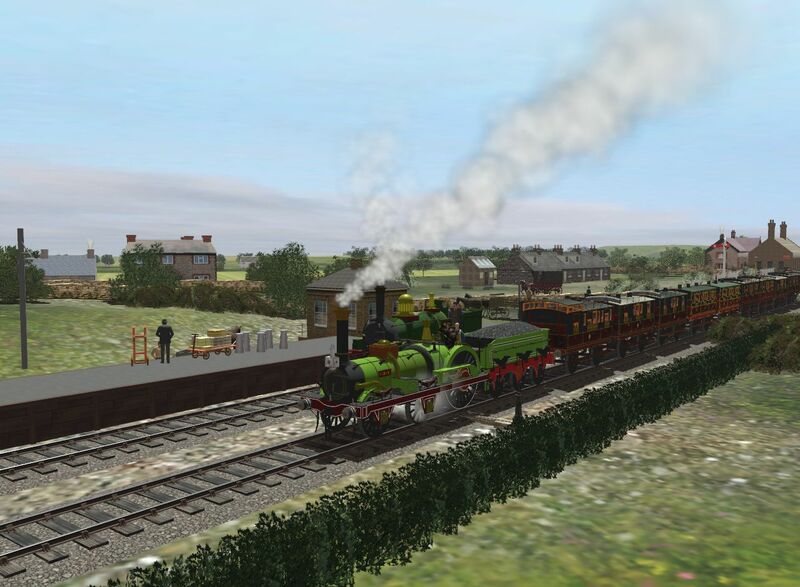 All screenshots were taken on my fictional ex-LBSCR Heritage Line route. Now, soon after the H stalled on the 1 in 80 and the pressure had dropped too low to do much more with it, so I walked up the line to Lentbridge to fetch another engine, this being the Station Pilot... I shall show the results of what happened in a separate post as I've uploaded too many pretty pictures! The rather cute little CR 498 No.510. Beautiful little loco, and I set off with it down the bank. 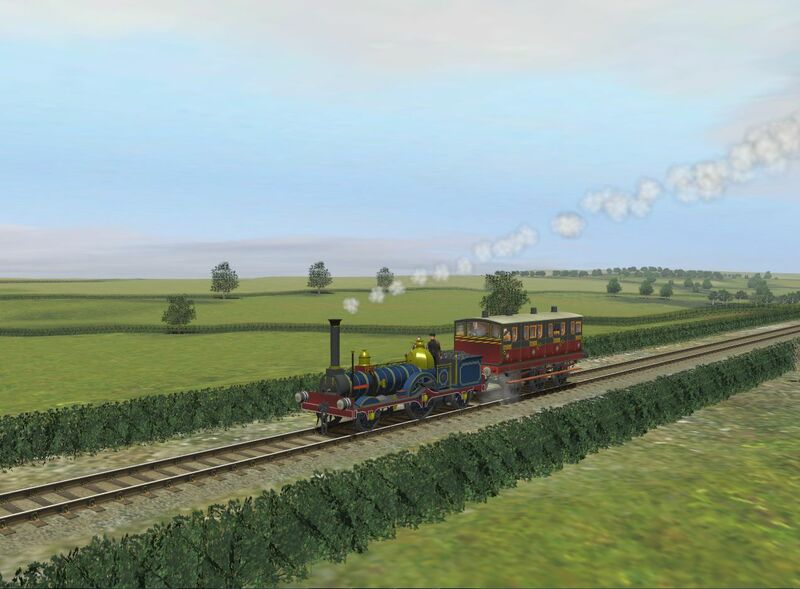 I then found I was able to run through the entire train and out the other side! So there's something seriously amiss with little 510. Not an issue, by this time the H had regained enough pressure to start off again. 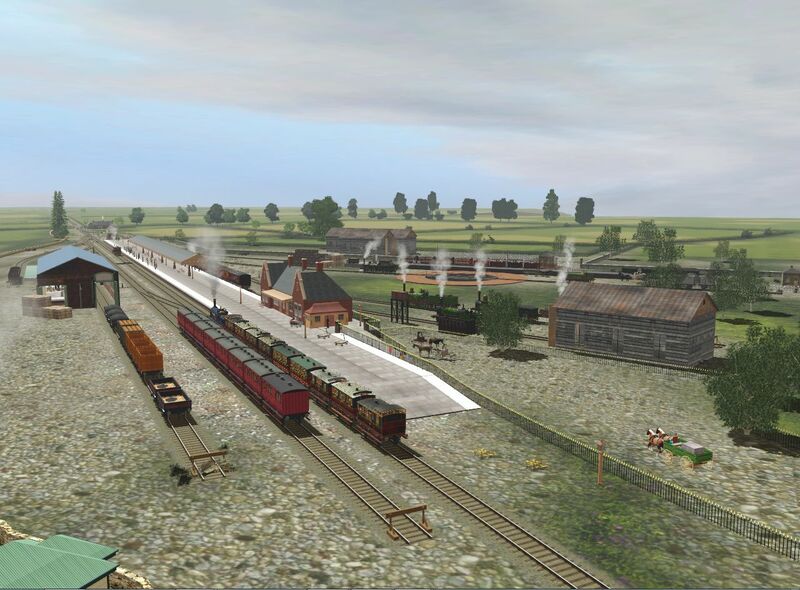 Sem, those pictures look magnificent, you’ve really captured a great “feel” for a railway setting. Well done. I’m a bit worried about the Caley “ghost” engine, though. Absolutely beautiful Sem. 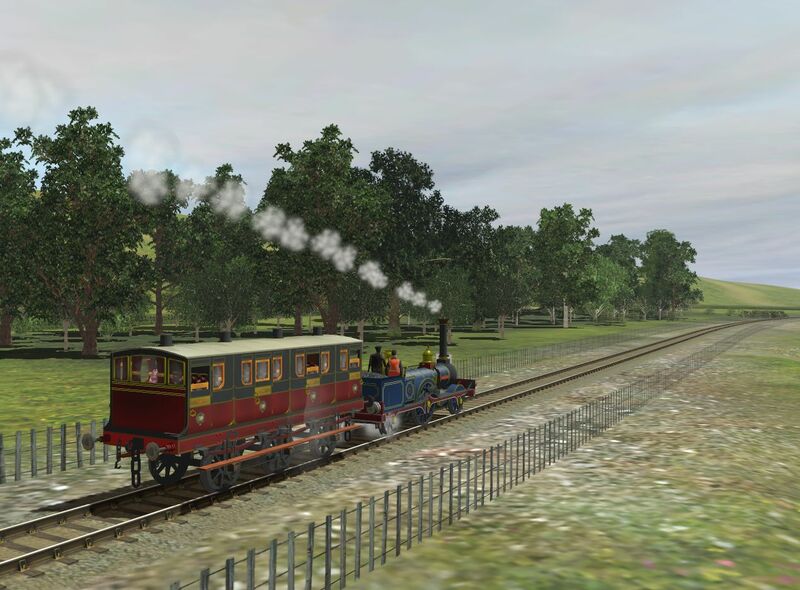 Some of those pics are so good you need to do a double take before you can assure yourself its not a real train. 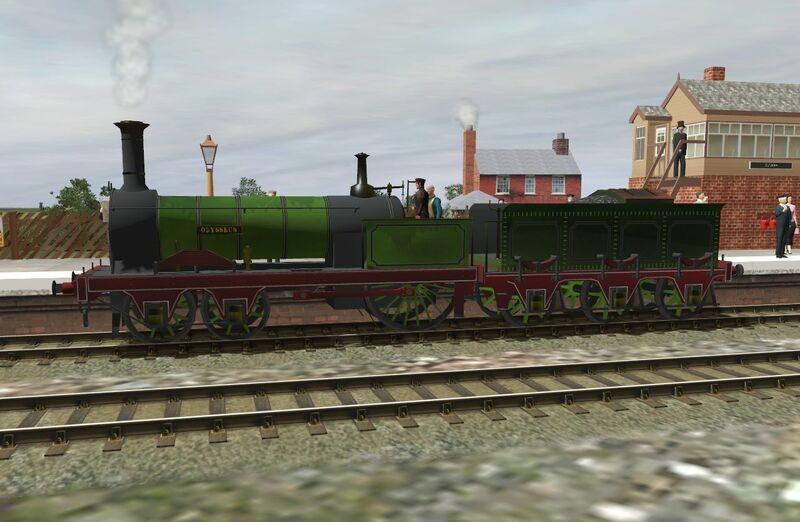 The standards of detail and accuracy in today's train sims is incredible. Annie. The detail of the ironwork of the luggage rails and brakesman's seats on top of the 1840s coaches is really fine. Very well executed. What were the rolled up cloths for? I guessed they were foul weather covers for the brakesmen but not every seat has one and there's a roll on the birdcage brake van as well. Eureka! The perfect prototype for my layout banker. A South Eastern and Caledonian Railway interleaved 0-4-6-4. Can you e-mail me the drawings please? Hi-jack away any time you want to Sem. 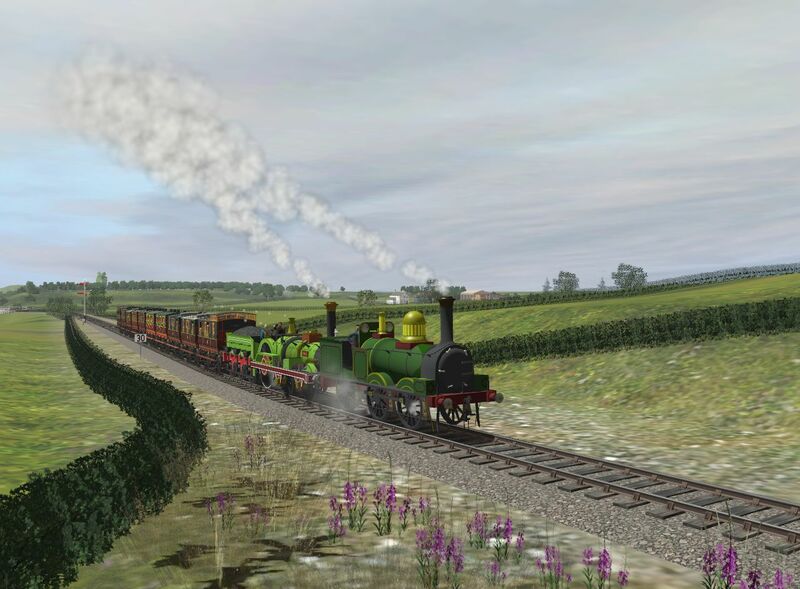 Your branchline has really come on since last we saw pictures of it and it really does look amazing. The rolled up tarps are for covering luggage Martin. The coaches can be setup to have luggage on their roofs and next time I'm messing about with the Minehead branch I'll place some luggage on the coaches roofs so you can see what it looks like. 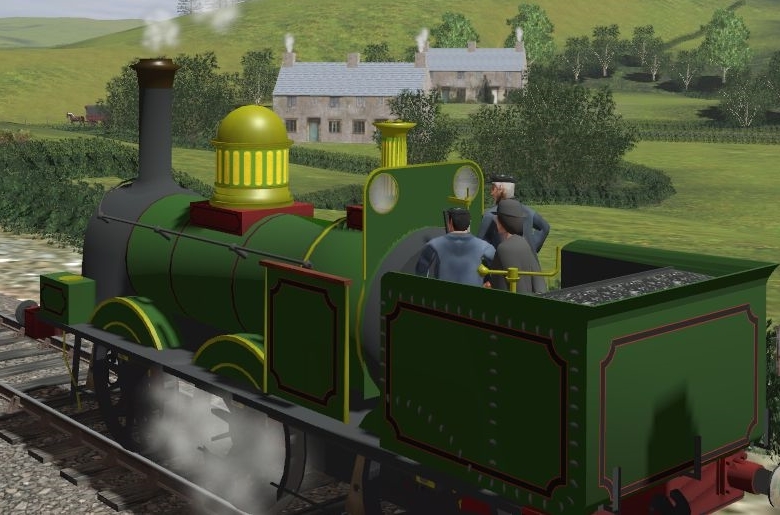 The 1840's coaches are all quite old Trainz models that Paul of Paulz Trainz made as part of a large commision to make models for a Trainz version of the Edinburgh docks. 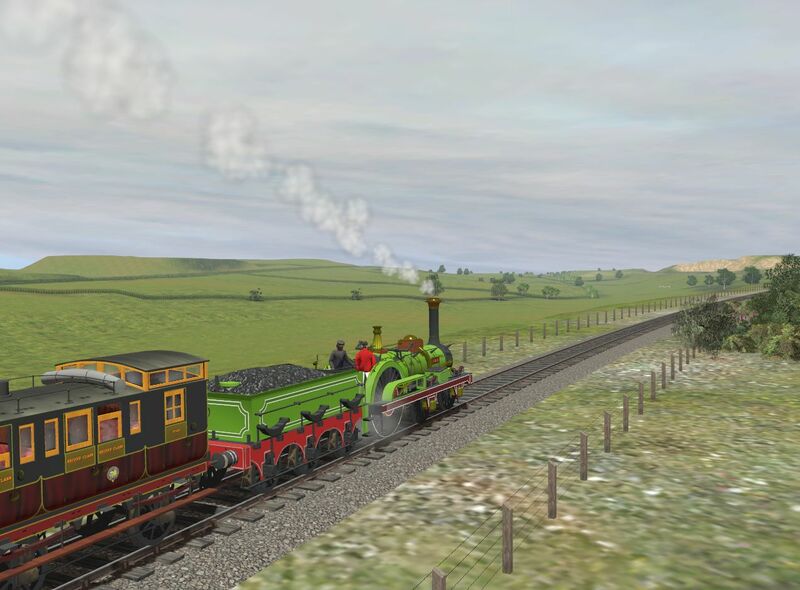 Nearly all my mid-19th century models were a part of that commision and I think not that many Trainz folk seem to know about them. I purchased all the 1840's coaches that Paul had made and while some of the first ones he did are more simple models with non-opening doors and plain roof details the later ones are really lovely pieces of work. Nice to be back running trains on my layout again. The Crampton gets a helping hand with the hard climb up to Crowcombe Heathfield. 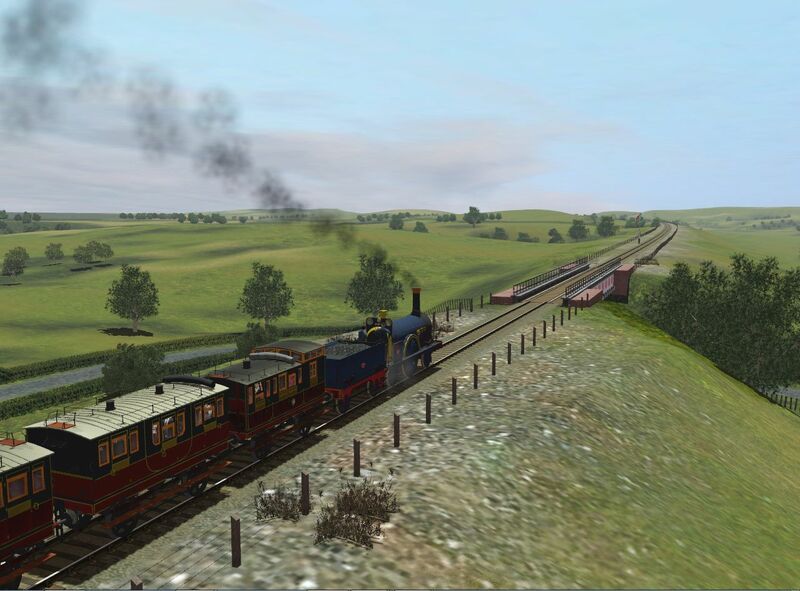 It was a bit of a fiddle driving two engines at the same time using the advanced steam engine controls, but also tremendously satisfying when I was able to get the two engines to work together on climbing that awful steep gradient. Since this was the first trial run of the E.B. Wilson well tank as a banker the shed foreman was on the footplate to supervise proceedings. And with the hill duly climbed without a hitch the Crampton carries on its way. It's all downhill from here to Minehead so there shouldn't be anymore difficulties. Strictly speaking, Annie, the tank is acting as a pilot loco. A banker would be at the rear, pushing. Yes you're quite right Jim. I did think about trying the E.B. Wilson well tank as a banker, but it might have got a bit too tricky with trying to drive two engines that were separated by the length of the train. Luggage. Not all the coaches are setup for roof loads, just the brake 2nd and one of the composite coaches. The other earlier type of composite coach has a luggage rack, but it's not setup for roof loads. There's a tarpaulin as well which is meant to look like it's covering something, but it's not very convincing so I don't use it.